This was the cover for Dragon Magazine #202, published in February of 1994. 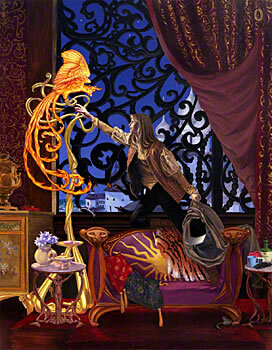 I actually painted it in November 1993; you can find the copyright on the cage the thief has to hide the firebird in. When I told Larry Smith, the art director of Dragon at the time, that I'd like to do a picture of a thief stealing a firebird, he said, "That would be a different look for us. Would it have big mag wheels, and an overbuilt engine?" So I put a couple of firebird cars in this picture! By the way, the model for this one is Becky; she's the sister of Sarah, who modeled for Music Lover. I took the reference photos for both paintings on the same day, and even turned in a sketch for this one when I turned in the sketch for Music Lover. It was rejected then, but patience (and a different art director) paid off! This print is now available from my Zazzle store. Prints from Zazzle aren't signed, but you can choose any size you want, printed on any of the various Zazzle papers (from cardstock to canvas.) The default size is 17x22 inches, the same size as the original. But you can get it printed in any size you want. 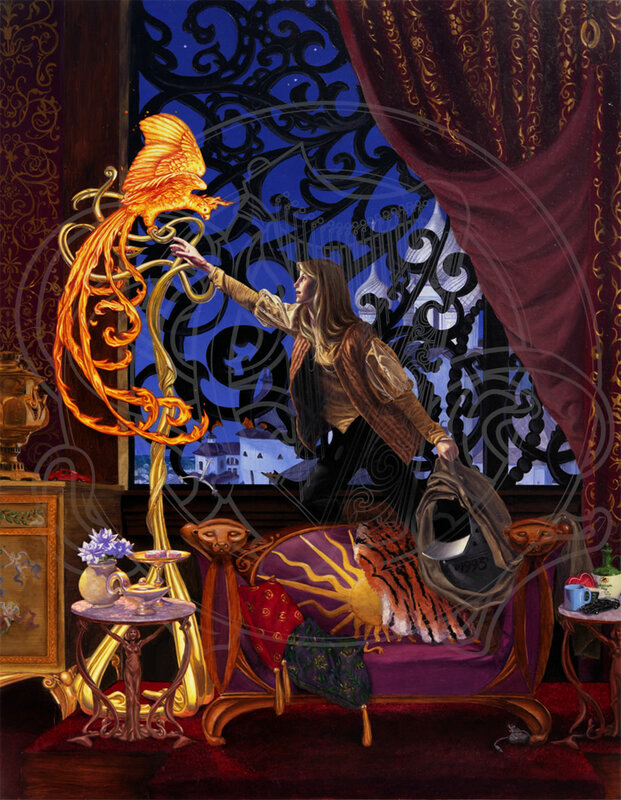 So, go to the Firebird print in the Zazzle store if you'd like one!